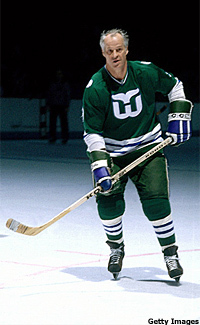 Gordie Howe joined his sons Mark and Marty on ice in 1973, when he suited up for the WHA's Houston Aeros. Mr. Hockey turns 80 years old March 31. Gordie Howe celebrates the big 8-0, and the stories about hockey's most famous octogenarian will be recited by Gordie's family, former teammates, friends, people who met him and people who watched him. There probably will be a story here and there from people who never watched him play or met him, but that is one of the more delightful aspects of Gordon Howe's life – which stories really did happen and which stories are figments of the imagination? Even Gordie doesn't know what is real and what isn't, and truthfully, it doesn't matter. Gordie Howe is an original, and there hasn't been another one like him. Howe won the Art Ross Memorial Trophy in 1951, 1952, 1953, 1954, 1957 and 1963. He was named the winner of the Hart Memorial Trophy in 1952, 1953, 1957, 1958, 1960, 1963. He won the Lester B. Patrick Award in 1967. He was made an Officer of the Order of Canada in 1971. He was inducted into the Hockey Hall of Fame in 1972 and inducted into Canada's Sports Hall of Fame in 1975. He played in the NHL All-Star Game 23 times. He won the WHA Most Valuable Player Award, the Gary L. Davidson Trophy, in 1974. He played in the WHA All-Star Game twice. He was on four Stanley Cup championship teams and two WHA championships with sons Mark and Marty. He was the last active person that played in the NHL during the 1940s and the 1950s who played in the 1980s. He was 52 when he retired as a member of the Hartford Whalers. Howe holds NHL records for most regular-season games (1,767), as well as the most seasons played (26). He scored the most NHL regular-season goals by a right winger (801), had the most NHL regular-season assists by a right winger (1,049) and the most NHL regular-season points by a right winger (1,850). Throw in his six years in the WHA and one year with the Omaha Knights of the United States Hockey League, Gordie Howe was an active player for 33 years. He also is the co-holder of the most NHL regular-season points by a father-and-son combo with his son Mark at 2,592. Of all of the things Gordie Howe did on the rink as a member of the Detroit Red Wings and the Hartford Whalers in the NHL and the Houston Aeros and New England Whalers of the World Hockey Association, that last record probably is the most meaningful. Howe retired after 25 seasons with the Red Wings in 1971 because of an arthritic wrist despite 23 goals and 29 assists in 63 games at the age of 43, but he always dreamed of the day he would play an NHL game with his sons Marty and Mark. It was an impossible dream, yet it was Howe's wife Colleen who pushed the idea. Only she knew it would not be the NHL because of the league's entry procedure but the WHA. "I always refer to that as my greatest accomplishment and excitement," Howe said of getting on the ice in a Houston Aeros uniform with his sons in 1973. "Let's put it this way – I don't remember what year it was, but my wife Colleen, who is a very imaginative young lady, took the junior club in Detroit (where Mark and Marty were playing at the time) and I joined the juniors and we played against the Red Wings for the March of Dimes. We raised a lot of money and we had 17-18,000 people in the stands. It was a bad year for the Red Wings, but it was a happy occasion. I was hoping at that time it was for real. "That reality came about when Bill Dineen and the Aeros came over and drafted Marty and Mark. Very few people know the fact who started the idea of the draft was Colleen. She got sick and tired of hearing people saying it’s too bad they had to wait until Mark and Marty turned 21. They said why would you do that? Is that an agreement between the OHA (Ontario Hockey Association) and American-born kids? She decided to take it upon herself, called the gentleman in L.A. (Gary Davidson) who was running the WHA and he said, as far as I know there was nothing. She said thank you very much and in conversation she dropped a hint and said between the OHA and the WHA and he said I don't think there is. 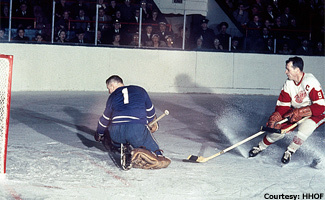 Check out more classic photos in the Gordie Howe gallery. "Bill and Doug Harvey, they walked streets and called the guy and got the same answer. The guy said isn't it funny, you’re the second person to call me. With that in mind, they drafted Mark and Marty off the list and my name got thrown into the hat later on." Gordie Howe made his debut with Mark and Marty in 1973 at a preseason doubleheader exhibition featuring the Aeros, Winnipeg Jets, Chicago Cougars and the New York Golden Blades at New York's Madison Square Garden. Howe scored on his first shift against the Jets. It shouldn't have been too surprising. Gordie had two years rest. With his kids in tow, Gordie Howe was the same rugged player in the WHA in his 40s that he was in Detroit in his teens, 20s and 30s. Pete Stemkowski was Howe’s teammate between 1968, when Gordie was 40, and 1971. Stemkowski was glad that he was on Gordie's side. Stemkowski, who played against Howe when he was with the Toronto Maple Leafs, said the best thing to do in playing against Howe was leave him alone. Of course, Howe didn’t sleep much on the ice, and Stemkowski has a theory about what kept Gordie going. So are the stories real or imagined? Stemkowski said probably real. Mr. Hockey is 80 years old March 31, and no doubt there will be plenty of Gordie Howe stories told. Whether all the stories really happened is debatable, but there is one thing for certain – Gordie Howe is one of a kind.